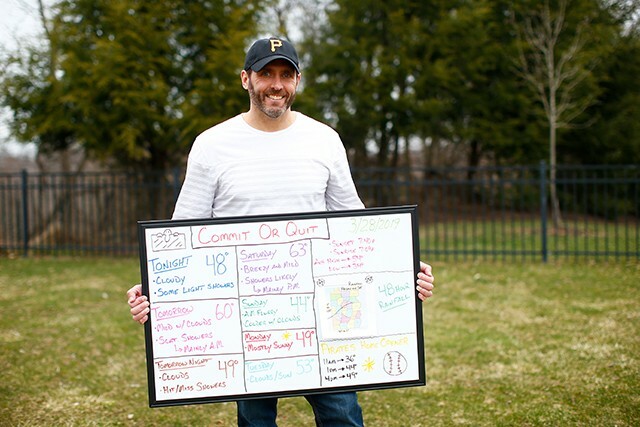 Jeff Verszyla holding his WhiteBoard Weather forecast in his North Hills backyard. Jeff Verszyla is in the running for Best Meteorologist in Pittsburgh Magazine’s Best of the ‘Burgh Readers’ Poll. This is not surprising considering Verszyla has more than 20 years in broadcast meteorology, a 2014 Emmy Award for his coverage, and a loyal fan base. What is surprising is what Verszyla doesn’t have: a job with a local news station. Last December, Verszyla was let go from his forecasting role at KDKA-TV after almost a quarter century of employment. There was little explanation given to Verszyla by the affiliate, confusing both him and his fans. But as his fans took to social media to express their sympathy and shock, Verszyla quickly realized that being let go from his job didn’t mean that he had to abandon the viewership he had fostered over the past 23 years. 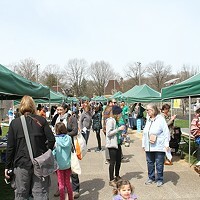 So with the support of his fans and the inability to escape the grip of a routine almost three decades in the making, Verszyla began delivering what he has dubbed “WhiteBoard Weather” reports on Facebook Live from his study, his backyard, and even the parking lot of his local Giant Eagle Market District. “I never thought that in a million years I’d be walking into Staples the Monday after I was let go and buying a whiteboard and markers and saying these are the tools of my trade,” he says. Jeff Verszyla showing viewers his WhiteBoard forecast via Facebook Live. 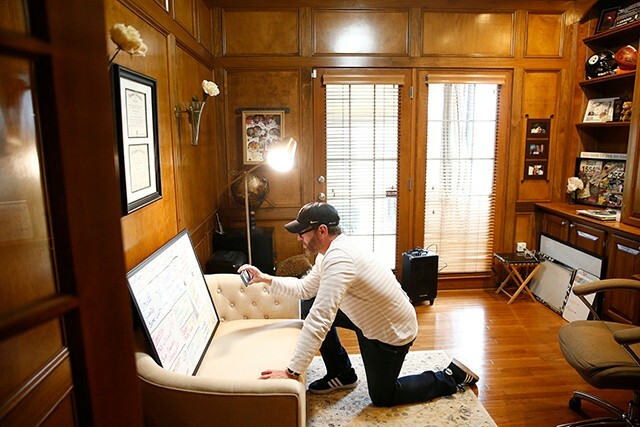 But to watch Verszyla casually queue up a background-music playlist on a rolling PA system, prop up his elaborately detailed whiteboard on his office loveseat, log into Facebook live, and begin greeting the viewers who join one by one, it feels like he has been producing a one-man weather broadcast his entire career. The results of his DIY weather forecast have been impressive. Not only is he nominated as Pittsburgh’s best meteorologist in a field otherwise occupied by nominees who have the benefit of a fully equipped studio, but his WhiteBoard Weather broadcasts have been popular enough to garner two partners, a handful of sponsors, and a brand new website (pittsburghweathernow.com) that will host his forecasts, user-submitted photos, explainer videos, landscaping tips, and a golfer’s forecast sponsored by Moon Golf Club. Jeff Verszyla delivering his forecast via Facebook Live. 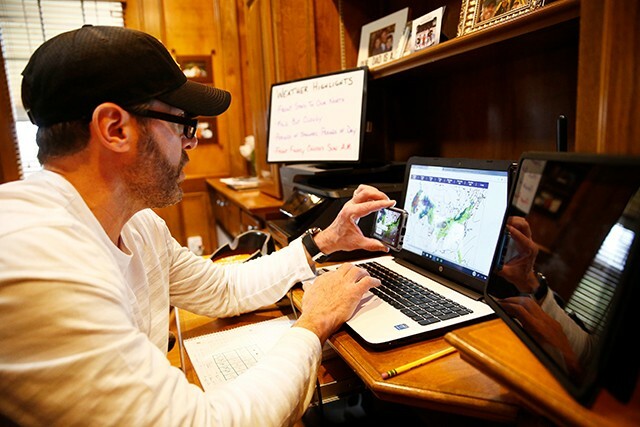 “While I love doing the weather, the challenge is you have to put food on the table so you want to try to monetize what you can,” Verszyla says, with a refreshing frankness. “Initially, as it kept going, it was like, 'we’ll keep riding this wave.'" Pittsburghers are loyal if not a little bit stubborn. We stick with the people, players, and TV personalities who have made the effort to stick with us. And that dedication is definitely working in Verszyla’s favor.